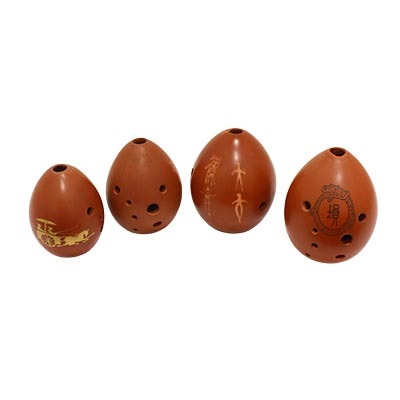 The xun is an ancient wind instrument made of mud or clay and likened to dragon eggs, due to its shape. Although not possible to verify most findings on this Chinese ocarina, all findings have shown that it has a long history. Amongst the traditional bayin classifications of musical instruments - the eight kind of materials include metal, stone, silk, bamboo, gourd, earth, hide and wood - the xun belongs to the earth category. In Zhejiang, a 7000-year-old clay xun has been found, rendering it the oldest xun artifact to have been unearthed. The same instrument has also been found in many archaeological spots such as Xi’an, Shanxi and Henan. Though each took on differing shapes such as oval, spherical, fish or egg-shaped, they were all made of clay. Subsequently, the xun’s structure became standardized; the clay xuns were all made to resemble an egg, with flat bottoms. They were then constructed using varying materials, such as stone, bone, ivory, porcelain and today, plastic; this was opposed to using only clay. The Chinese xun was mainly used to perform court music, but was not merely limited to that. It was also played amongst the common people. During that period, the xun was known to possess only one to five playing holes. Today, xuns that are used in the Chinese orchestra possess up to eight or nine playing holes, thus rendering them able to play a full octave. Similar to the dizi, the xun comes in different keys. Want quality Xuns from a trusted source?